Give normal to dry skin the shave it craves. This natural, soap-free, conditioning formula is packed with rich botanical emollients for a smooth, soothing shave. Enriched with aloe vera, calendula, lavender and vitamin E, this concentrated, hydro-active cream maximizes water absorption to help fight dryness and chaffing. The result is effortless razor glide and a comfortably close, soothing shave with less irritation. Hypo-allergenic. Since 1979, Alba Botanica has offered natural, 100% vegetarian personal care products that do beautiful for you, your friends and the animals and Earth you love. This means we DON'T use parabens, sulfates, or phthalates. We make a full range of products packed with potent natural, botanical ingredients that are formulated to nourish the individualized needs of your skin and hair. Because the Alba Botanica is committed to the health and happiness of all furry friends, we never test our products, or the ingredients that go into them, on animals. We recognize the need to be good stewards of all natural resources. So we try to do beautiful by reducing our environmental impact in everything we do as a business, from the field to the final product. We hope that you join our do beautiful campaign. Together we can help to preserve and heal the planet, now and for future generations. 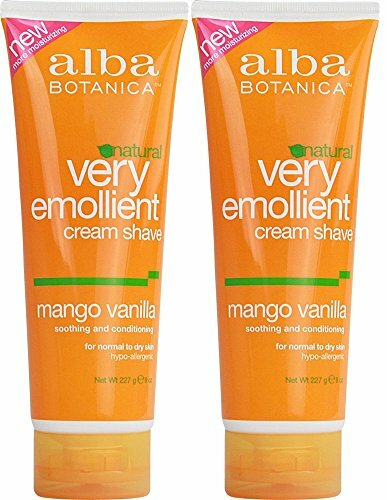 Alba Botanica Very Emollient Mango Vanilla Shave Cream, 1.5 oz. Hydrate skin and making shaving a breeze with Alba Botanica Very Emollient Mango Vanilla Shave Cream. Made with botanical extracts such as aloe vera, jojoba, mango, vanilla and antioxidant vitamin E, this rich cream nourishes and protects skin from irritation, nicks and cuts. Our shaving cream is soap-free and packed with conditioners to give you a comfortable shave. Our 100% vegetarian formula is hypo-allergenic and does not contain any parabens, phthalates or harsh sulfates. It is also not tested on animals. Includes one 1.5 oz. 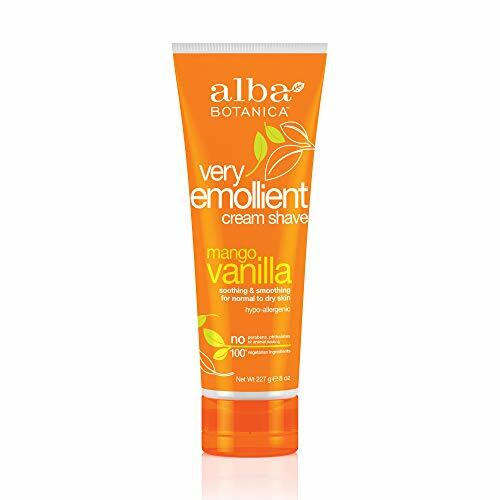 tube of Alba Botanica Very Emollient Mango Vanilla Shave Cream. At Alba Botanica, our product family constantly evolves alongside health, beauty, and ingredient knowledge and trends. We’re dedicated to making high quality, 100% vegetarian products that overflow with botanical ingredients. Do beautiful – that’s the motto that motivates our body loving products that nourish the skin, hair and, of course, the soul. 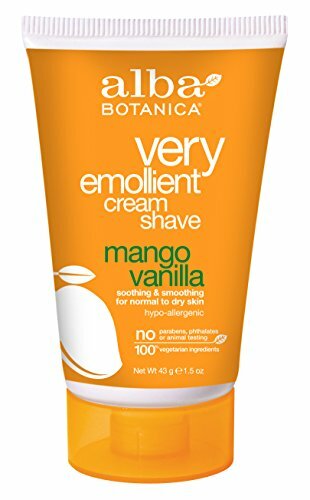 Alba Botanica Very Emollient Mango Vanilla Shave Cream, 8 oz. Hydrate skin and making shaving a breeze with Alba Botanica Very Emollient Mango Vanilla Shave Cream. Made with botanical extracts such as aloe vera, jojoba, mango, vanilla and antioxidant vitamin E, this rich cream nourishes and protects skin from irritation, nicks and cuts. Our shaving cream is soap-free and packed with conditioners to give you a comfortable shave. Our 100% vegetarian formula is hypo-allergenic and does not contain any parabens, phthalates or harsh sulfates. It is also not tested on animals. Includes one 8 oz. 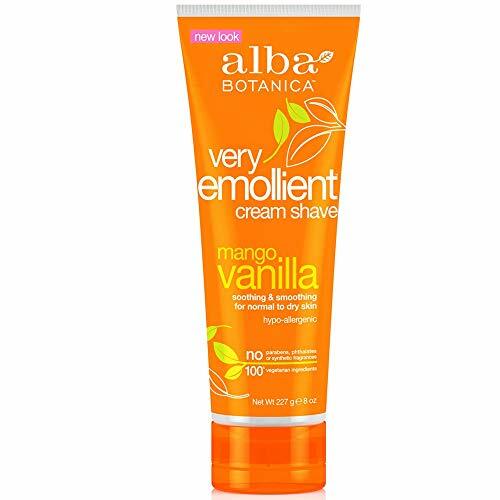 tube of Alba Botanica Very Emollient Mango Vanilla Shave Cream. At Alba Botanica, our product family constantly evolves alongside health, beauty, and ingredient knowledge and trends. We’re dedicated to making high quality, 100% vegetarian products that overflow with botanical ingredients. Do beautiful – that’s the motto that motivates our body loving products that nourish the skin, hair and, of course, the soul. Organix South - TheraNeem Organix Neem Cream Original Vanilla - 2 oz. Alba Botanica - Natural Emollient Cream Shave Mango Vanilla Soap-Free - 8 oz. Want more Alba Mango Vanilla Cream similar ideas? Try to explore these searches: Toyota Camry Washer Reservoir, Bulldog Photo Frame, and Perforated Mens Leather.